It was the culmination of 7 months of training and around 5 years of planning, procrastinating, talking and preparation – to say I was happy is an understatement. I was working on a 22 hour schedule and my training had went well so I was confident going into round. The forecast was mixed – wind increasing through the day and intermittent cloud, 70% of cloud free summits. At least I wasn’t going to be roasting in the 30 degree heat we’d had the previous weekend. Upon arriving at the Denton House hostel where everyone was staying I was treated to a rousing rendition of happy birthday (yes it wasn’t a coincidence that I was doing my round on my 42nd birthday), and after having some food at Wetherspoons I tried to get some last minute rest in the dorm. 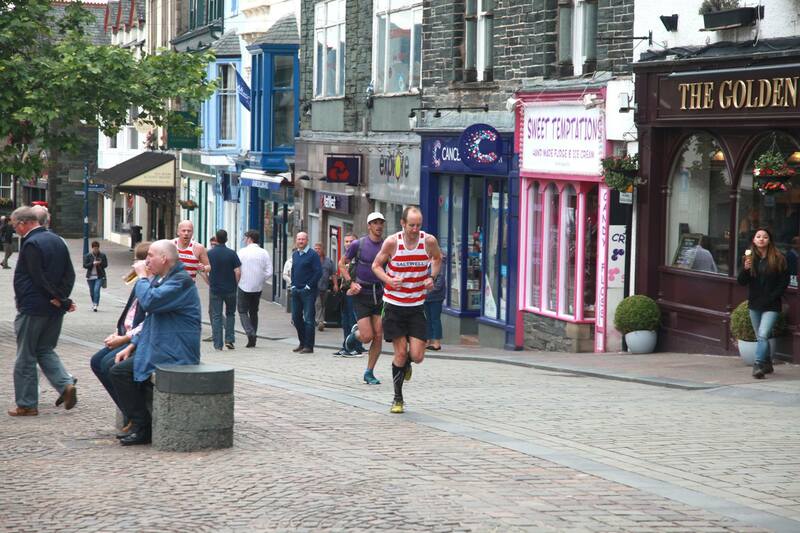 There was only myself and Bob Neil on the first leg. I felt a little guilty as it meant that he’d have to carry all my kit/food etc but Bob is a machine and I told I would return the favour when he decides to do a round of his own. Harra, Phil James, Decca and Catherine Vicarage were planning on meeting us at the top of Great Calva where Harra had promised me a Custard Tart to celebrate my birthday. 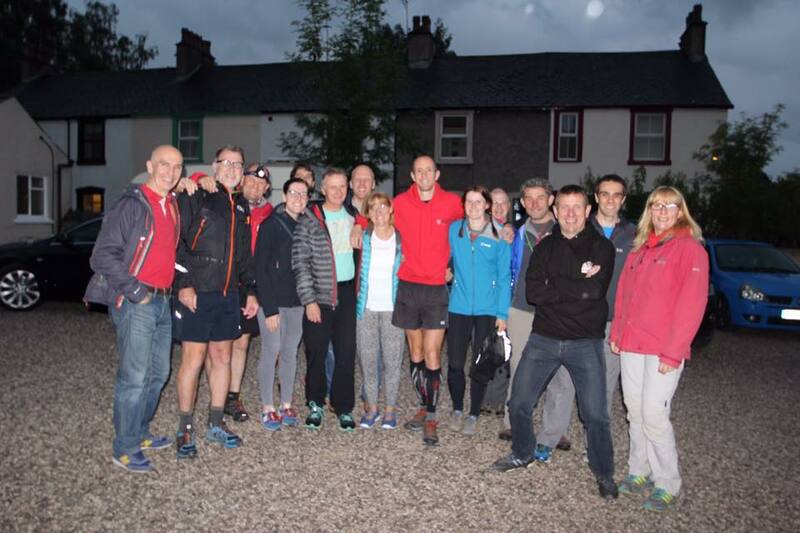 I set off at 10pm at which point it was still light and we made good progress, passing Harra and co just after Latrigg Car Park. About half way up Jenkin Hill we were into the clag – no big deal as the path up Skiddaw is like a motorway but the temperature dropped and it started to rain so it was time for my waterproof and buff. We reached the top around 5 minutes up on schedule and conditions had deteriorated again. 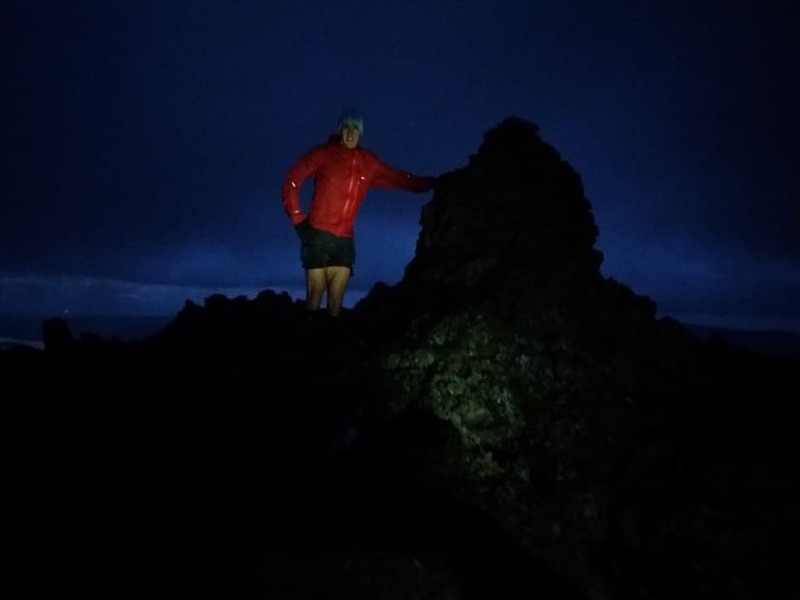 The wind was gusting across the top blowing the rain into our faces and there was no point in putting our head torches on as the light just reflected straight back at us. We dropped down to the right of the path to find the fence line and style which we did no problem and crossed over and picked up the grassy trod. It was now like being in a different world, we were sheltered from the wind, the clag had lifted and it had even stopped raining. Coming off Calva we found the trod no problem and started the slog up Mungrisdale Common on the way to Blencathra. I had decided to descent via Doddick Fell instead of Halls Fell as I’ve always been quicker coming down that way. Although not as bad as Skiddaw the clag was still blowing in and out and the rocks were greasy so my mind was definitely made up. Coming down from Blencathra we slightly overshot the turn off to Doddick Fell and had to retrace our steps but I realised straight away so a few minutes lost but no big deal. 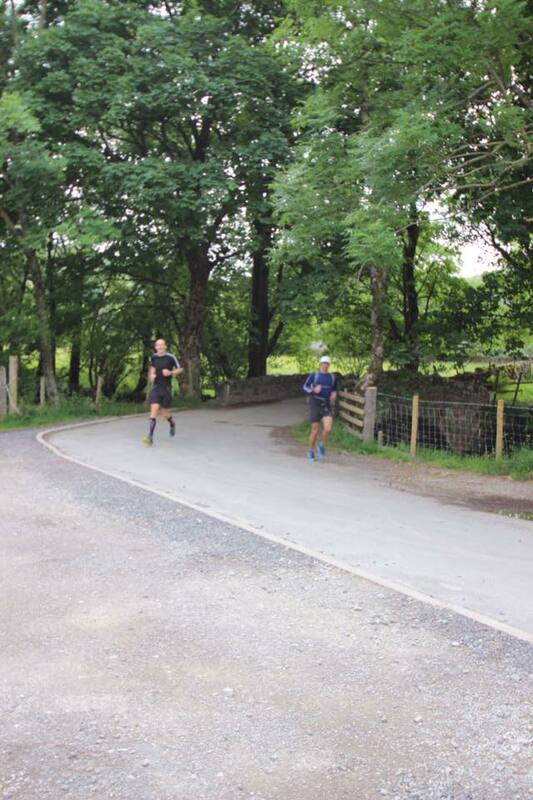 Before I knew it we were running through Threlkeld and into the first changeover. I said goodbye to Bob who was again going home to do his post round. I had lost the time I made on Skiddaw on the decent from Blencathra but was bang on schedule and I felt great. Gillian, Steve and John were waiting for me and made sure I had food and drinks available – I quickly had a sandwich, cup of coffee and took a banana for the road. 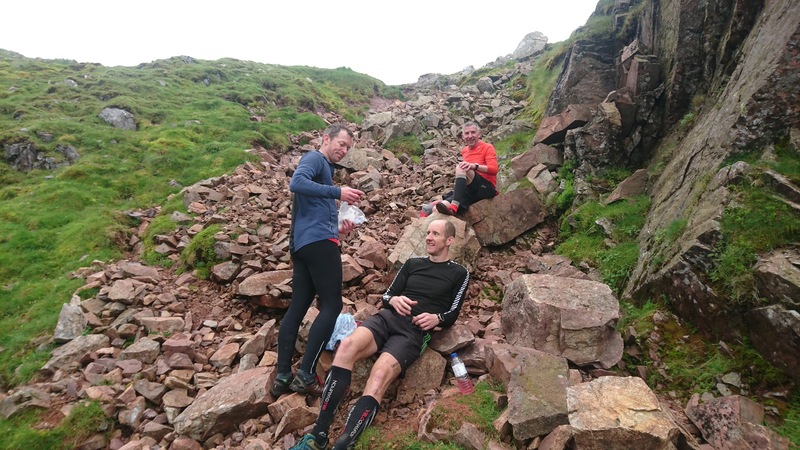 Accompanying me on the next leg were Iain Armstrong, Jim Thompson and Chris Redfern and we set off at a gentle jog towards the next big climb of Clough Head. 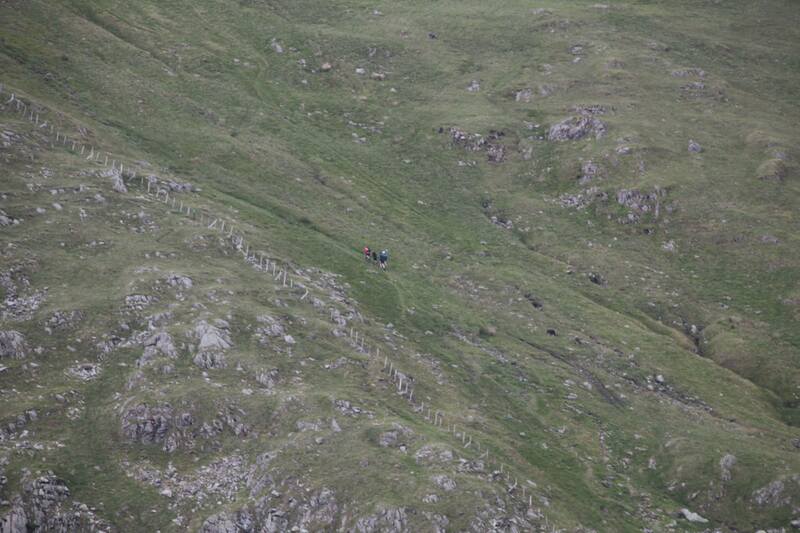 My biggest strength is probably my climbing, especially the really big steep climbs of which Clough Head is one. Unfortunately, this was bad news for Chris who had dropped off the back and as we once more entered the clag again near the top we lost sight of him. We reached the top without him and I made the decision to push on instead of waiting. I did feel bad about this but it had become colder so I didn’t want to hang around and I also still felt good and wanted to keep moving as there is good time to be made on this section. Chris had done the leg before so I hoped he would be able to get back down ok.
Once at the top it is possible to take a more direct line through the Dodds as a shortcut so he may have been able to catch us up, however it was still dark and the clag was down so it would have been difficult for him to find that line. We proceeded to the next fell, Great Dodd but descending from there we veered a little too far to the left and had to make up some ground so lost a few minutes but just like Doddick Fell nothing to be concerned about. 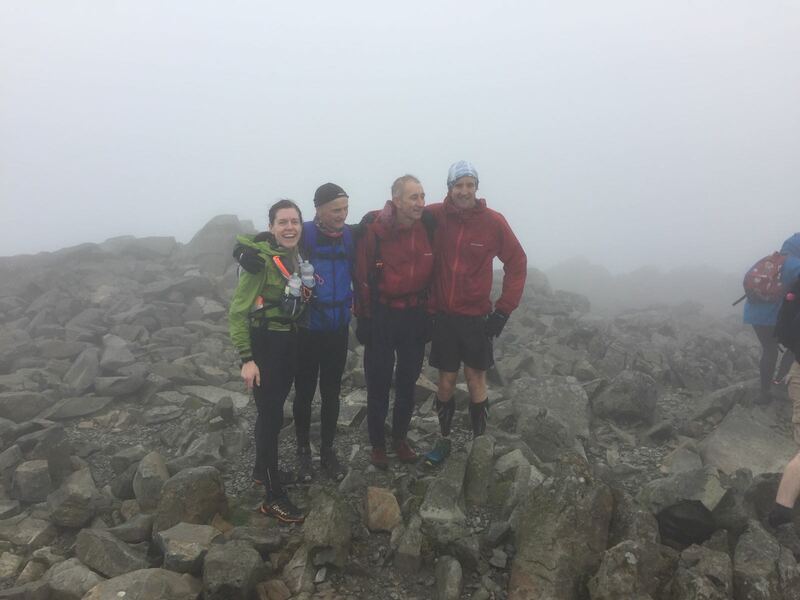 The Dodds are easy to navigate in good weather but in mist they can be tricky and Jim did a great job in getting me through them whilst Iain was feeding me Kendal Mint Cake. As we reached Helvellyn Lower Man the wind was getting stronger and I was becoming increasingly colder. Jim must have sensed this as he asked how I was doing. He suggested stopping at the shelter on Helvellyn to put some more layers on but I wanted to push on – I knew that in around half an hour we would descend to Grisedale Tarn and it would be significantly warmer and more sheltered down there so I didn’t mind being uncomfortable until then. We descended Dollywagon Pike via the fenceline down to the tarn and I was warm again. The clag had also cleared and for the first time I was able to take in and enjoy the magnificent views. 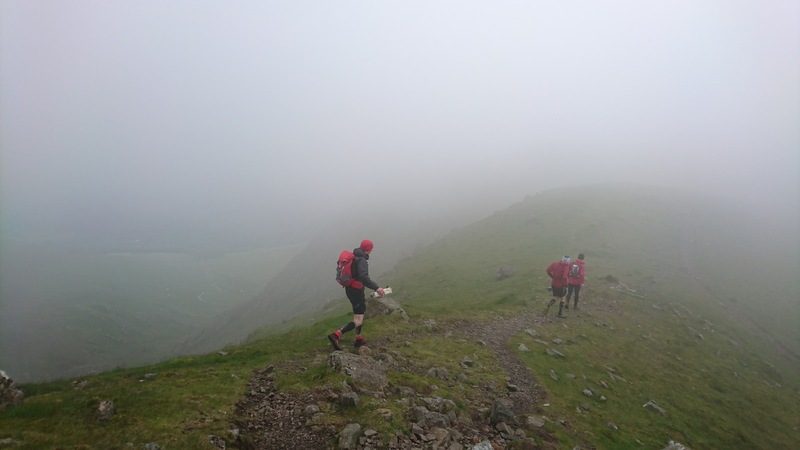 Ticking off Fairfield amd Seat Sandal, the last peak on the leg we then made good time on the lovely grassy descent to Dunmail Raise and leg 2 was done and dusted – 17 minutes ahead of schedule. I was glad to see Chris there. He had made it back safely despite being sent the wrong way by another BGR group and visiting the summit of Clough Head twice. My right hip had been hurting a little on the descents on this leg so I took some painkillers which seemed to sort it out as it didn’t bother me again. My foot was also hurting so I hoped the painkillers would help that too. Again I was overwhelmed by the amount of food and drink that Gillian & Steve had prepared for me. I had some baked beans+sausages, pasta, coffee and flat coke and some chia seeds. Keith took a few sandwiches for me for the climb up Steel Fell and then we were away. Peter and Gemma had set of about 10 minutes before us and we reconvened at the top of Steel Fell. This next section was very boggy but Keith took some good lines to try and avoid the worst of it. 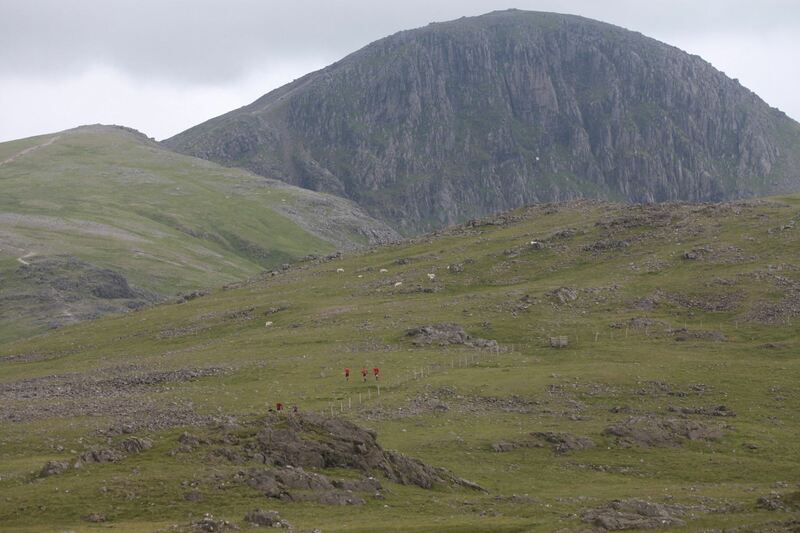 When we reached the top of High Raise we could see another group of walkers who looked like they were taking part in some sort of organised challenge. 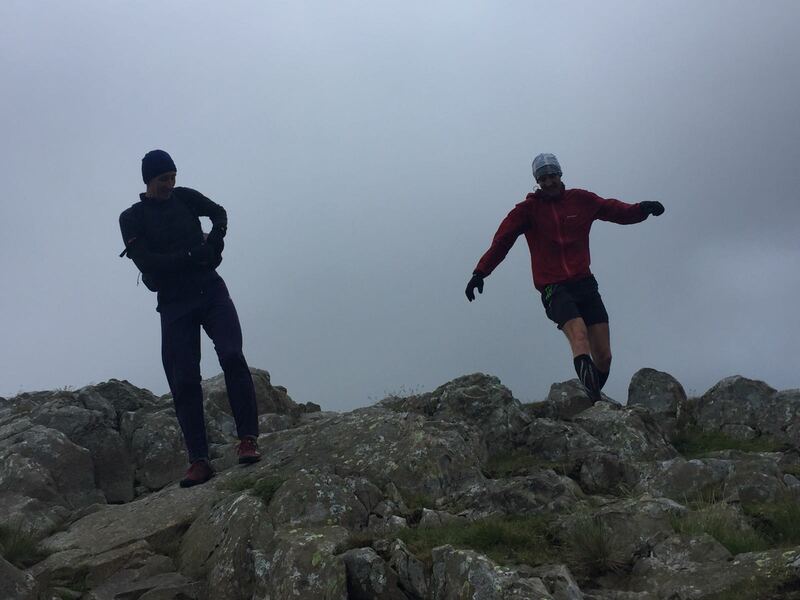 It turns out they were competing in a 10 peak challenge and we encountered many more of them during the remainder of this leg and the next. We pressed on and by the time we reached the Langdale Pikes Keith told me I was 15 minutes up on schedule and suggested we have a quick break which we did. Looking over we could see the Scafells shrouded in mist which was going to make the next section tricky. 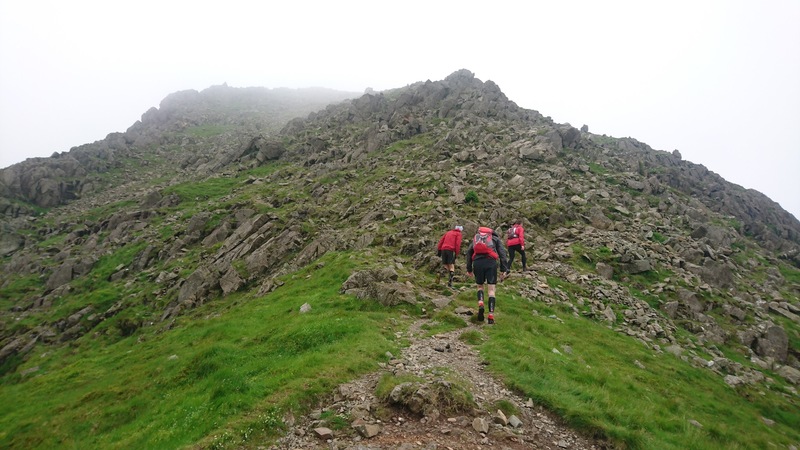 This section between Bowfell and Scafell is the most technical and rocky of the round and also the most difficult to navigate – Ill Crag and Broad Crag are huge boulder fields which are seldom visited because of their proximity to Scafell Pike. The climb up Bowfell is biggest on this leg but I’ve always enjoyed it and we made swift progress to the top and into the clag which would last until Scafell. Esk Pike was ticked off and then we set off towards Great End. In good conditions you can take a more direct line to the top, however Keith told me because of the conditions he preferred to stick to the path as the summit is quite flat so finding the summit cairn would be tricky in the clag. Progress over Ill Crag and Broad Crag was very slow because of the slippery rocks (it’s difficult to make fast progress at the best of times) – there are deep gaps between some of the huge boulders in which you could easily break a leg if you slipped so I was very cautious. There were a lot of the 10 peaks walkers on this section -at the top of Scafell Pike Keith told them I was doing 42 peaks and I got a round of applause which was nice. Descending towards Mickledore Keith was a little concerned we were on the right track and we stopped for a few minutes just to check bearings and look at a more detailed map. Within a minute of continuing we were at the stretcher box, confirming our position and I was relieved – I have complete faith in Keith’s navigation and he had gotten me through the toughest part in very poor conditions. I had originally planned to climb Broad Stand but unfortunately Jonny’s daughter had netball trials so he had to pull out so we went via Lords Rake and the West Wall Traverse instead whilst Gemma and Peter descended on the tourist path to meet us at Wasdale. 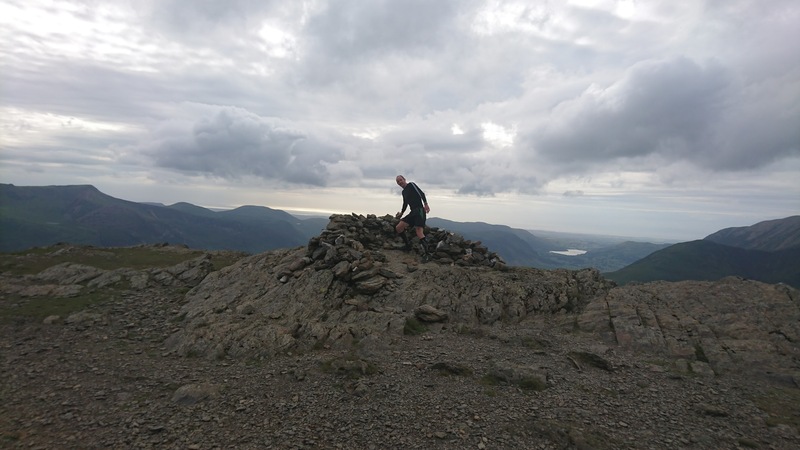 For anyone who has not done this route I would thoroughly recommend it – it’s one of the most exhilarating ways to a mountain top up a very steep scree slope which cuts across Scafell Crag and then another steep traverse to the summit – you really get the feeling you are inside the mountain. Keith wanted to stop for a few minutes at the top of Scafell which we did, before the long descent to Wasdale. We came down the 2nd scree shoot from Rakehead Crag which was much better than the 1st scree shoot I had come down a few months earlier and I really enjoyed the descent. I think I spent most of the steep grassy section after the scree coming down on my arse – it was certainly faster than running! 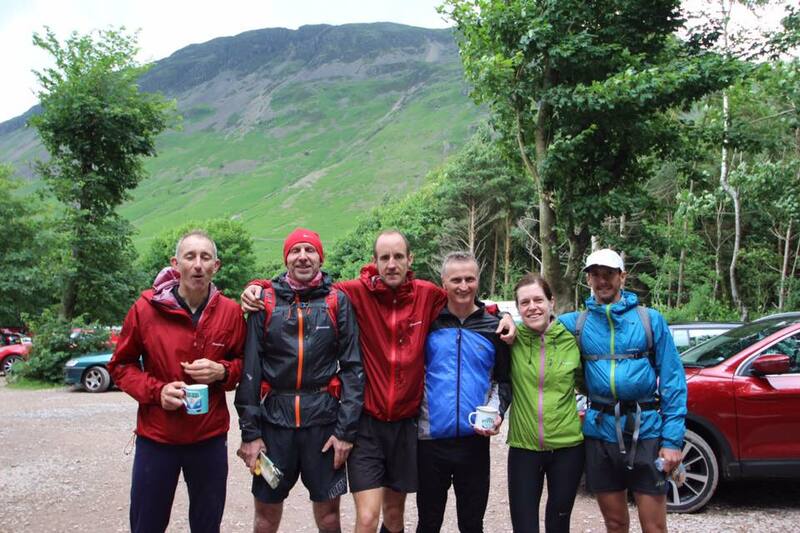 Gemma and Peter met us at the stream and we all ran into the National Trust car park together to complete the leg. Wasdale is a pivotal point in the round and a one where many people give up – the long descent from Scafell is a real quad thrasher and the next climb up Yewbarrow is probably the most brutal of the round – it’s extremely steep and relentless so it was good to be coming in still feeling really strong. 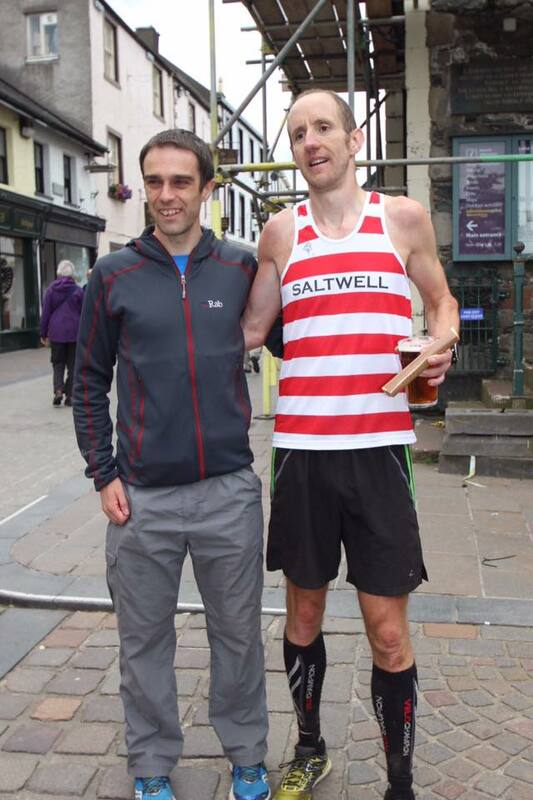 Paul Richardson informed me that we were going to play a game of the tortoise and the hare, his way of telling me that he was setting off up Yewbarrow before me. Steve washed my feet for me and Gillian cleaned my shoes and got all the scree out of them. I also brushed my teeth to stave off any potential ulcers from all the sweet stuff I’d been eating (a problem Jim told me he had suffered with). I’d lost 35 minutes on leg 3 – a combination of going via Lords Rake instead of Broad Stand, and the poor conditions. This combined with a longer than scheduled stop meant I was 33 minutes down on schedule leaving Wasdale. This didn’t concern me at all though as I still had an hour and a half contingency and I was still feeling strong and moving well. As well as Paul who had already set off John Butters and Fred Smith were also accompanying me on this leg. John set a good pace going up Yewbarrow (or Yew-B**tard as he calls it) and half way up Fred informed me that we were on 36 minute pace and not 47 minute pace (per my schedule) but it felt comfortable and I made 12 minutes on the climb and another 6 on the next climb to Red Pike at which point we were back in the clag again. This might have taken its toll on me as for the first time I started to feel a little tired and my foot was also hurting again. Luckily it didn’t last long and a cup of tea from Fred, slice of maltloaf, a gel and some painkillers after Steeple sorted me out. Descending from Pillar the clag cleared revealing fantastic views down into Wasdale and Ennerdale – Paul commented that “you can see the pub from here”. You could certainly see the Wasdale Head Inn but I still had a long way to reach the pubs of Keswick. 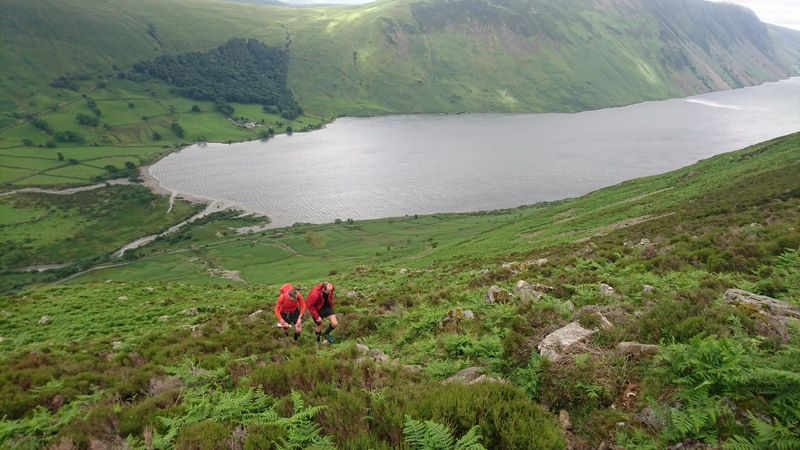 We ascended Kirk Fell via the Ennerdale race gulley at which point we stopped for a quick snack and admired the views. 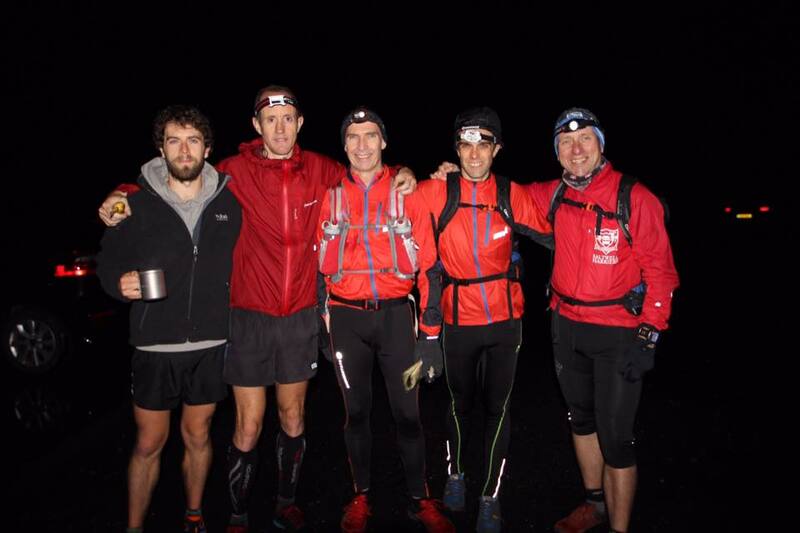 On the top of Kirk Fell we were joined by Jim Thompson, Dave Bradburn and Simon Long who had ran in from Honister via Moses Trod to run the final section of the leg with me. 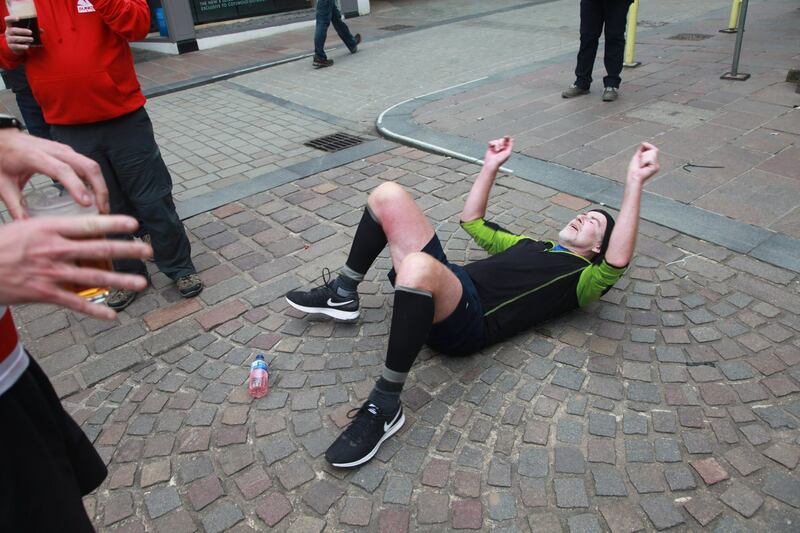 Iain had also planned on meeting me here but I learnt later that he had been in some pain on leg 2 so decided against it which was totally understandable. There was only one big climb left now up to Great Gable which I enjoyed and Paul took a good line on the descent, bearing right of the path to avoid the rocky scramble. 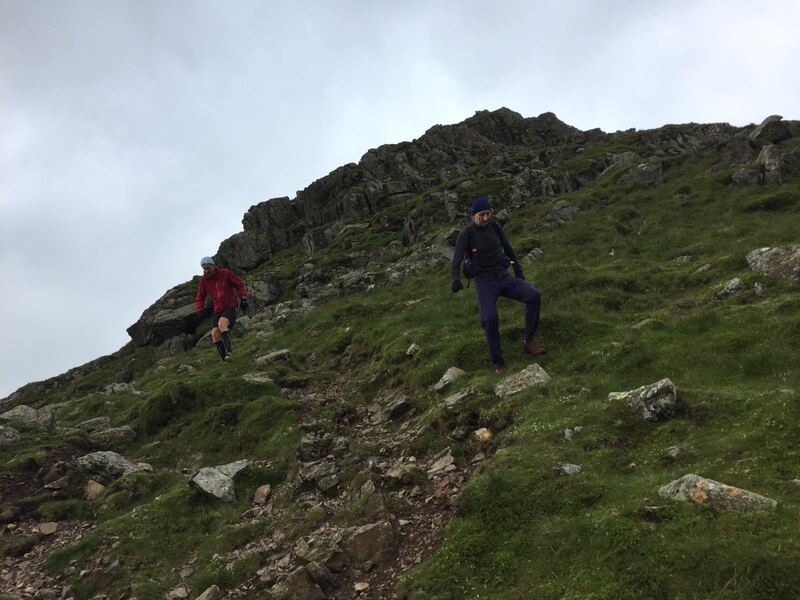 The next section over Green Gable, Brandreth and Grey Knotts was good running – unbeknown to us Satch was waiting for us on the top to Grey Knotts but unfortunately none of us saw him. 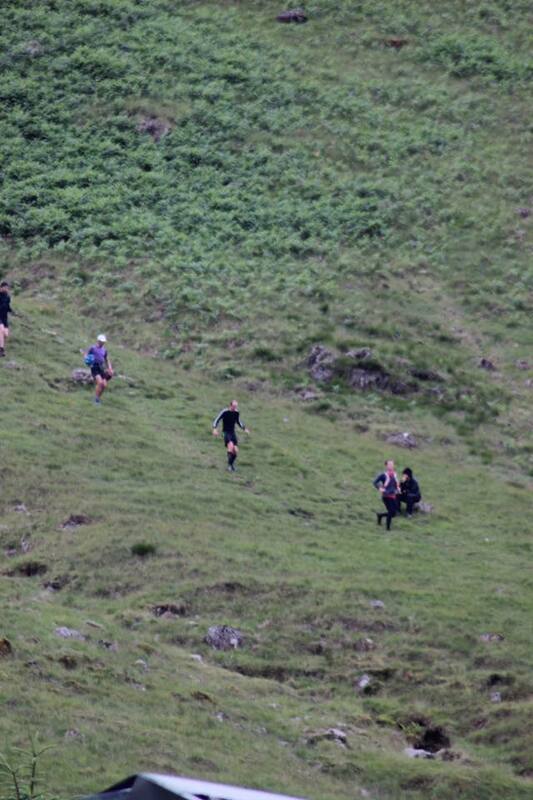 Another fast descent and I was running into Honister feeling absolutely fantastic. There was never a point when I thought that I wasn’t going to make it but it still felt good to running into the last changeover and seeing everyone there waiting for me. I had made 38 minutes on the leg which meant I was now 5 minutes up on schedule. 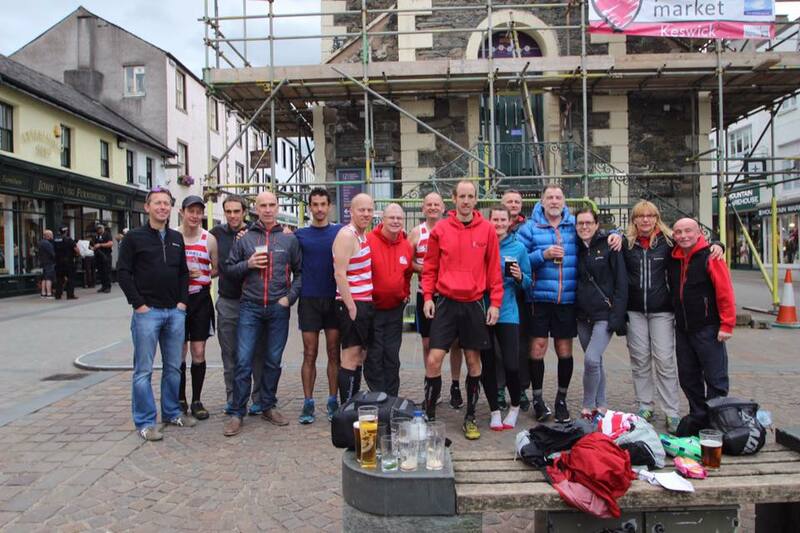 John Walton, Harra, Phil James, Simon Long, Andrew Softly and Catherine Vicarage set off shortly after I arrived at Honister to get a head start. After a quick toilet stop I set off up the final big climb of Dale Head with Tim Forster, Dave Bradburn and John Butters. 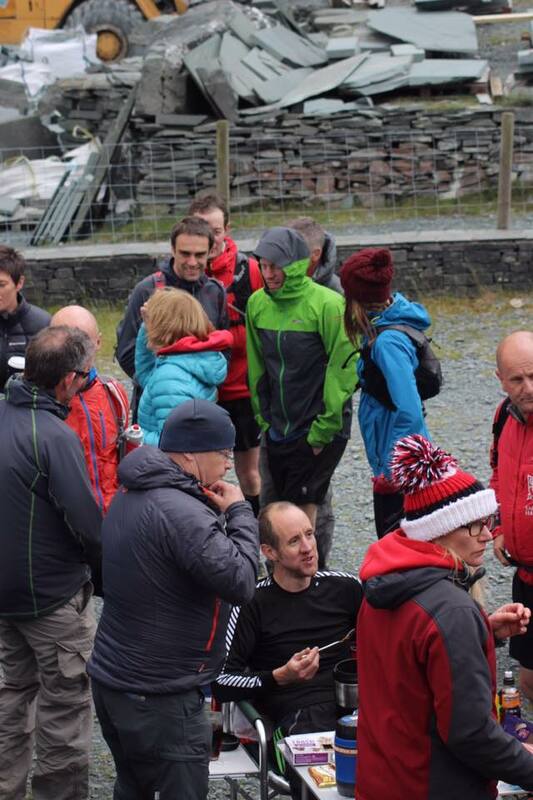 catching up with the rest of the team at the top and Malcolm who had also walked up. Some of the team went straight on and cut out Hindsgarth which is pretty much an out and back. Then it was time for the final climb and the final peak, Robinson. 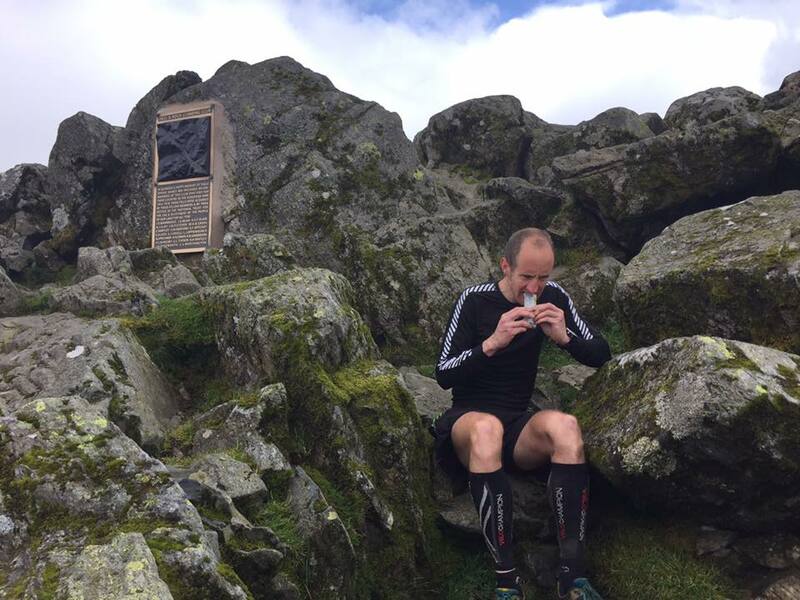 It felt fantastic to touch the last cairn – number 42 – just the run in to Keswick to go now. I had previously told Tim that I wanted to take the grassy alternative to the rocky scramble at the top of Robinson so we veered off the path. We went a little too far to the right and ended up at the top of the crags and had to come back up a little but it wasn’t a big deal. Soon we were descending the lovely grassy descent down to the tarn where I paused with John B. Looking back up I could see everyone coming down but there was no sign of John W. Someone shouted that he had rolled his ankle and that Dave B had went back up for him. Tim told me to push on so I did down the path and eventually joining the road. As we approached Little Town we spotted Steve and Gillian waiting by the road up ahead – I think were surprised to see us so early and raced off ahead to get back to the car park before us. A quick change into road shoes and my Saltwell vest and it was time for the final 4.5 miles along the road. 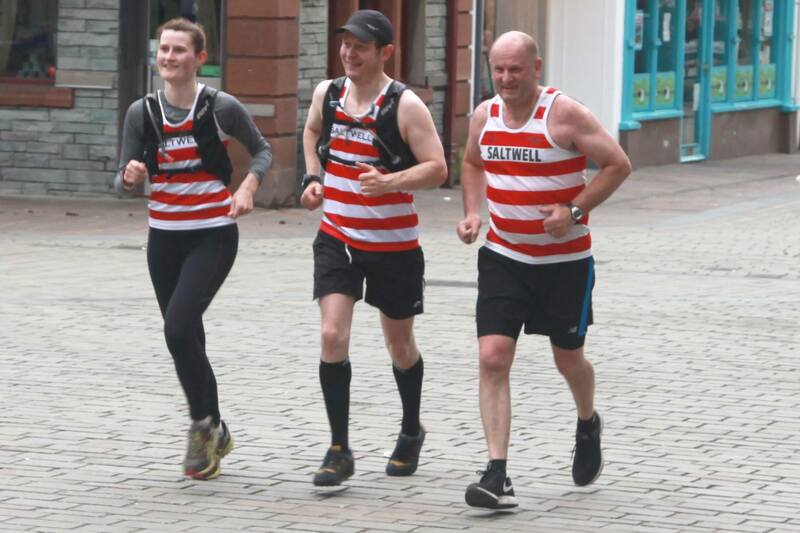 I still felt great so made good time on this section running with John B and Andrew with the others following behind and before I knew it we were on the outskirts of Keswick. 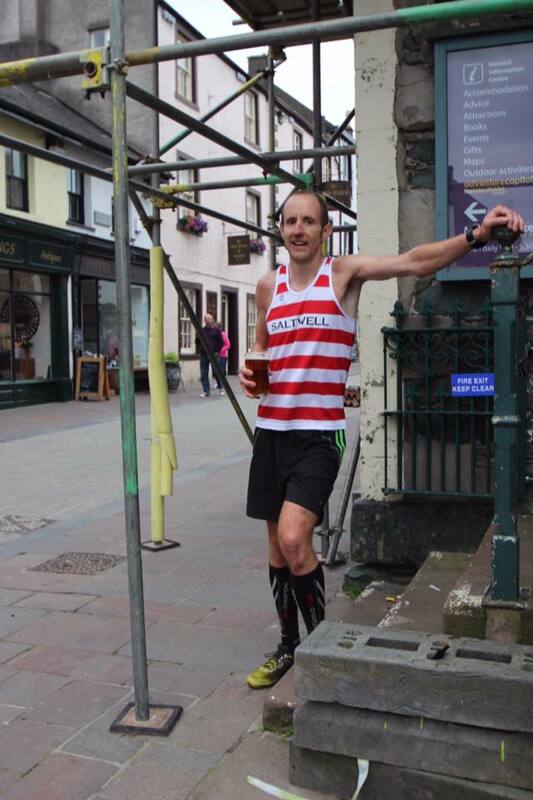 The feeling of running up Keswick high street with everyone cheering me on was incredible and I raced up the steps to touch the door of the Moot Hall 21 hours and 19 minutes after setting off from there the previous night. 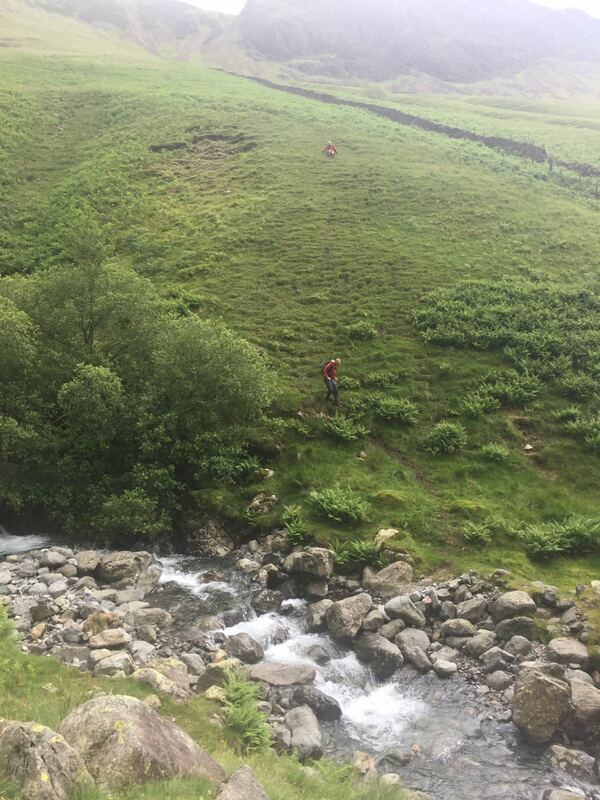 Steve handed me a pint and I stood at the top of the steps and tried to contemplate what I had just achieved – 66 miles, 42 peaks and 27,000ft of ascent. Iain was one of the first to congratulate me and welcome me to the club which was a fantastic feeling after all the training we have done together and supporting him on his round 4 weeks previously. The rest of the team then started to come in, first Phil, then Tim , Harra, Catherine & Simon , Dave and finally John W who’d valiantly pushed on and completed the run in – I was glad to see him and relieved that he was ok.
Gemma told me I needed to have something to eat so we retreated to the Kings Arms and she very kindly bought me some Fish and Chips, although I only managed about half of them. I stayed in the pub for another hour or so before walking back to the Hostel and finally getting some much awaited sleep. So what are the main things I learnt from my round? For me the hardest part was constantly eating and drinking. It’s totally different to the way I train and I had to force myself to keep taking fuel on board. I did feel a bit sickly a few times because of all the sugar but it didn’t affect my running & passed after a while. One of the pieces of advice Keith gave me beforehand was to enjoy the day and I can honestly say that I enjoyed every last second of it. Amazingly I didn’t have a bad patch and never had a single negative thought enter my mind. I never thought about how long or far I had left to go or what climbs were left – on every leg I just looked forward to seeing my support crew at the changeovers and running with them. I’ve probably done more training than most people would for a round and I think this was the biggest factor in why I felt so good on the day and didn’t have any issues. I was also able to regularly eat and drink, even though most of the time I didn’t really feel like it. 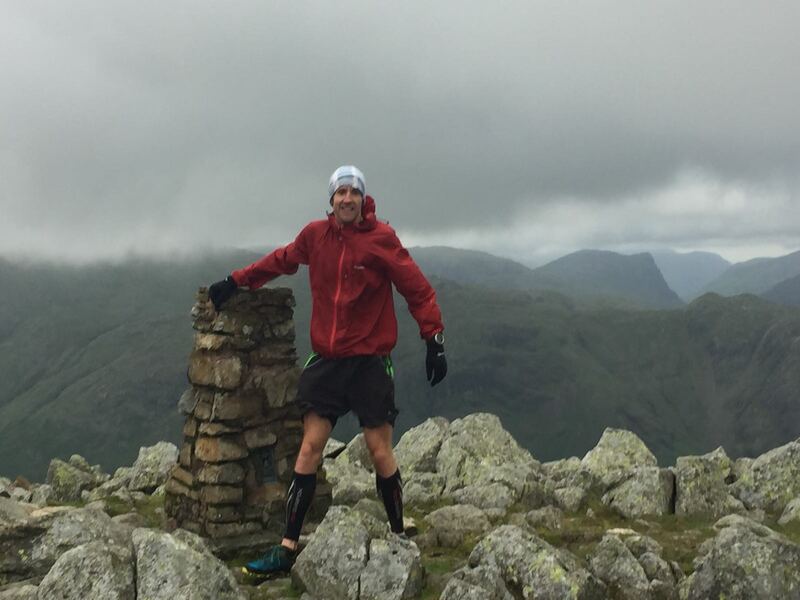 I didn’t have any soreness in my legs at all which meant I could take the descents (relatively) fast – the only problem I had was my soreness in the balls of feet which I’ve had for months and I was able to run through that. I must also give a massive thanks to all my support team. Amongst others I had the 2 reigning winners (male and female) of the Chevy Chase and 6 people who have previously completed the round running with me. I simply could not have a better team and I want to especially thank Steve, Gillian and John – it was a very long day for them too and they couldn’t have looked after me any better. 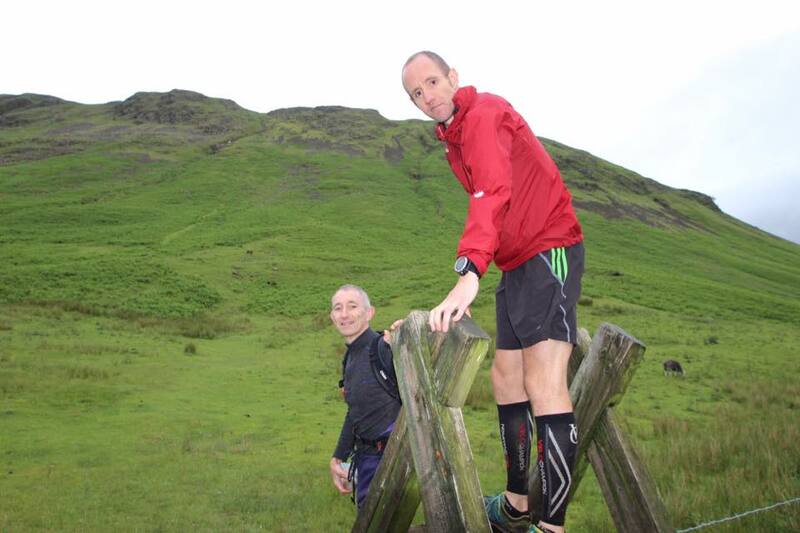 I would thoroughly recommend anyone who has an interest in fell running to give the round a go – as long as you can get the right training in beforehand then you are definitely in with a shout. 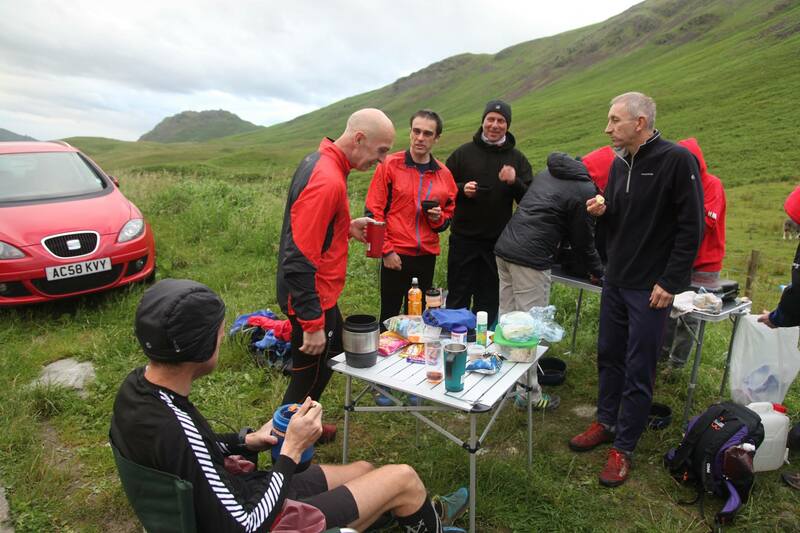 Oh, and if you’re wondering what happened to the Calva Party…. Well they missed the turn off and ended going half way up Skiddaw. No-one had a map but luckily Catherine was able to use an app on her phone to pinpoint their location and after attempting to pick up the right path they decided to call it a night and retreat back to the car. 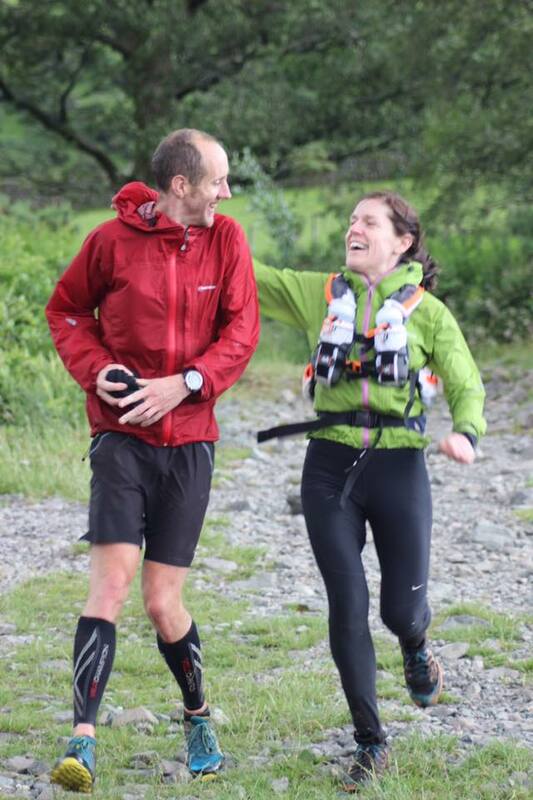 This entry was posted in Fell Running, News, Race Reports, Rob by Rob Brooks. Bookmark the permalink.